Learning about President Dwight Eisenhower in American History? 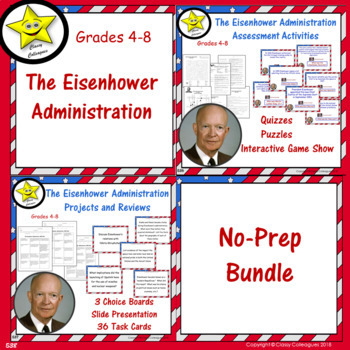 Included are No-Prep quizzes, choice boards, slide presentations, crossword and word search puzzles, interactive game shows (Jeopardy format), and task cards, all about the Eisenhower Administration. Great for review, test prep, and assessment. Engaging, content-rich, fun! Need another era in American history? Check these out! Please visit our store often at Classy Colleagues. Download our freebies. Browse through our items to find just what you need. Become our follower by clicking the green star next to our store logo. receive a notice when we upload a new product to our store. Our products are guaranteed, and your feedback is important to us. If you are satisfied with your purchase, please leave positive comments to let others know how this resource has helped you. We strive for a full A/4-Star rating on every product, and we want you to be very satisfied with your purchase. If you need us to make improvements, or if you find an error, we request that you contact us directly with your suggestion so that we can provide you a revision. Please help us serve you best by offering us that opportunity if you encounter any problem with your download. You may contact us by email at classycolleagues@comsouth.net or you may leave a question on our TPT store page for a prompt response. Look HERE for specific tips on printing .pdf files. Look HERE for specific tips on opening ZIP files. Please let others know how this resource has helped you. Go to your My Purchases page. Beside each purchase you will see a Provide Feedback button. Simply click it and you will be taken to a page where you can give a quick rating and leave a short comment for the product. Each time you give feedback, you receive feedback credits that you may use to lower the cost of your future purchases. When you’re ready to exchange your credits, go on My TPT and select TPT Credit Balance. Share this product with others by pinning it to Pinterest! Start a new board for Classy Colleagues products or add it to one of your existing boards! Just click on the Pin It button above to share it! Your friends will thank you, and we will, too! Copyright © Classy Colleagues. All rights reserved by author. This product is to be used by the original downloader only. Copying for more than one teacher, classroom, department, school, or school system is prohibited. This product may not be distributed or displayed digitally for public view. Failure to comply is a copyright infringement and a violation of the Digital Millennium Copyright Act (DMCA). Clipart and elements found in this PDF are copyrighted and cannot be extracted and used outside of this file without permission or license. Intended for classroom and personal use ONLY. Helping you help students is our mission. Classy Colleagues wants to help you exceed your highest professional goals and expectations by providing you with teaching products that make your teaching journey easier and more rewarding. We are passionate about helping children learn to be the best they can be. Indeed, our interest is in serving. It is our desire that by sharing our ideas, skills, and knowledge with you that we can continue to make a positive difference in the lives of countless individuals. We do all in the name of the Lord Jesus, giving thanks in all things. To God be the glory! ♥THANK YOU for visiting Classy Colleagues and browsing, adding to your wish list or purchasing! ♥We look forward to having you back real soon.